RumorPedia.net has acquired some exclusive details on the upcoming AMD Bulldozer Processors. The Details were given out by a picture which was given out by Gigabyte’s corporate network. The picture which you can see below has some interesting details on an Unlocked FX Series processor with CPU-z and a few benchmarks running in the background. The CPU “AMD FX 8110” has a core clock of 2.8Ghz as seen from the windows experience index however CPU-z shows its running at 3.8Ghz which is because of the AMD’s Turbo boost technology, The socket supported by the chip is Socket AMD3b 942 and has a maximum TDP of 95W. The CPU consists of 8 cores and 8 threads, 8MB of L3 Cache and an Unlocked Core. Instructions supported are seen in the CPU-z tab. The two benchmarks running in the background are Wprime v2.04 which records a score of 5.516 sec (32M) 166.895 sec (1024M) and Super PI score of 7.8 sec (1M calculations) 7 min 22 sec (32M calculations). 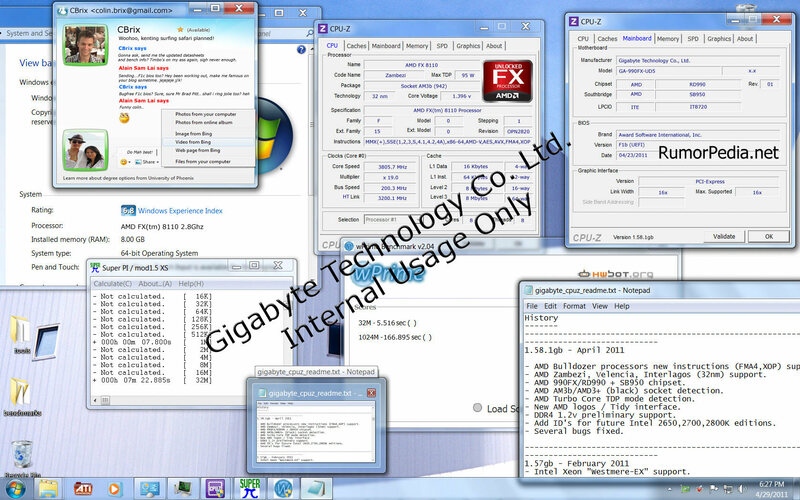 The motherboard being used is from Gigabyte with model name GA-990FX-UD5. The AMD Bulldozer based platform along with Llano AMD Fusion are going to make debut at this years Computex 2011. You can check out more here. Update: Gigabyte has confirmed that the Details are Fake.